We have a small terrier mix that we adopted from our local humane society about seven years ago. “Max” loves to be outdoors and often follows my son around the backyard or through a nearby field. Several times my son has commented how Max has actually made a trail through the yard, where the grass is pushed down and in some places much shorter. Max seems to always follow that trail when he’s headed back to the house. Many wild animals do the same thing. If you’ve ventured into the woods, you may have seen a network of trails or paths that animals use over and over again. The trails usually follow the easiest route over the landscape, resulting in a “roadway system” through the woods or other habitat. The animals tend to follow this roadway system since they know it so well. Some trails are species nonspecific, which means that many different kinds of animals follow them. These paths are used frequently and rarely change. 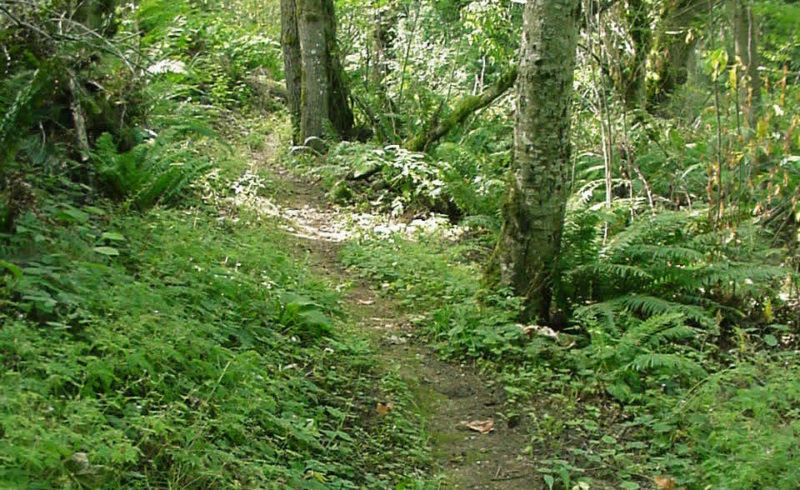 Because the trails are used so much, the vegetation is often beaten down or missing altogether. Paths that are used less often are sometimes called runs. They are usually used by a particular animal and will often change. There may a run that connects a feeding area to the main trail. The run could also lead to a den or watering area. If you find an animal trial in the woods, you can do some detective work to discover what animal uses it. Look for animal tracks in soft soil. You may also find bits of fur stuck in branches along the path. Also look for twigs and grass that may have been bitten off. A clean cut indicates an animal with incisors, such as a rodent. Twigs and grass that have a serrated edge were probably bitten off by deer. So as it turns out, the path through our yard is much like a path through the woods. Not only does Max follow it, but we often find ourselves on the same little trail!